Enjoyed the video – just love how the white skates pop! Cute skates. I like your work with pencils. I won’t have guessed that these skates were pencil coloured. Amazing. Love the shading on the blades! The white skates really stand out on the berries! Thanks for sharing! Just love, love, love the skates. These tags are plain awesome!!! I really like these skates and the way you did this tag. What a great way to get a bright white skate on the Desert Storm coloured paper! Love the red laces. Wish I had had red laces as a child. They are so pretty! Gorgeous tag! Love the traditional feel of these tags. The pencil on craft paper is beautiful. So pretty! A friend of mine has skates like this that she uses to decorate with. Love them! I watched the video for this tag yesterday but ran out of time to leave some love. I am a huge fan of kraft and coloring with pencils. I think this tag is my favorite, i’m going to rewatch the video. You are the best Sandy. Thank you for sharing. 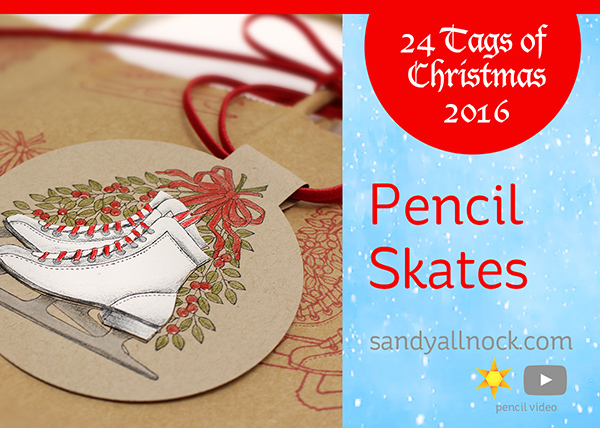 Love, love, love the pencil ice skates tag. I envy your talent. Beautiful tag. The added dimension is really nice. Great tag, I like the idea to make a loop out of a strip of cardstock. Thank you for sharing and for the chance to win the trags! Lovely tag. I am getting so many tips and inspiration! The skate tag is adorable. Thank you for the great video. Love ice skating… and tags in the mail!!!!! Gorgeous! That skate stamp is really wonderful. Love how you think – to make your tags different from anyone else! Thank you for all you have taught me over the months. Love your tags. I’ve never ice skated, but would still love to color them. Thank you for sharing your talents and your creativity. Gorgeous tags! Love the skates! These tags are wonderful. Love the way you added the white skates onto the kraft. Good call with the fussy cutting. Looks awesome. Thanks for the scoop on the amazing pencil sharpener. I LOVE it! Gorgeous coloring – love the skates. Loved all of your tags and videos. Wonderful ideas. Love my pencils and copics. Thank you for your wonderful videos. I always learn something from your videos. Thank you for sharing your great tag ideas. Always look forward to them! Every day is an adventure in coloring! Thanks for sharing. I’d love to win these tags. Great tag love the skates. How do you leave a comment on you tube? 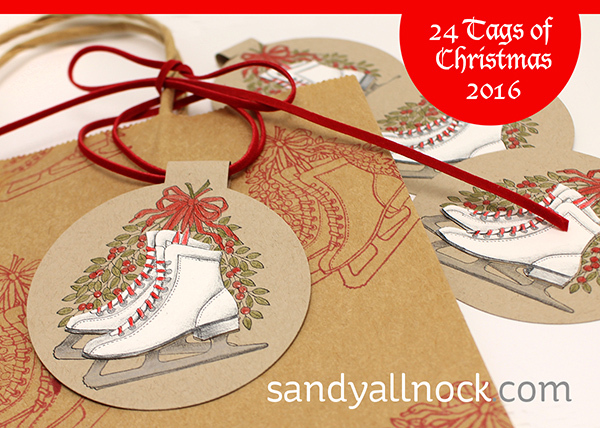 Thanks so much Sandie for another gorgeous video, I would be thrilled and honoured to win these gorgeous tags. Thanks for the chance. This is is such a great idea…thanx for sharing your talents. If I tried to skate on these I’d fall and break something. Love the tag though. I love this tag! Brings back memories of skating on Christmas day. Love the ice skates. Like that you fussy cut them. It does make them pop that way. I think it pops more with the fussy cutting than if you had colored it in. These are so pretty. I love the idea for creating the loop with the pencil. Thanks for the great ideas! Thank you for sharing the circle with tab great idea! Love the pencil coloring as usual. Hey, I just remembered a question I have. Does the Neenah paper have enough tooth to allow for layering and shading the color with your pencils?